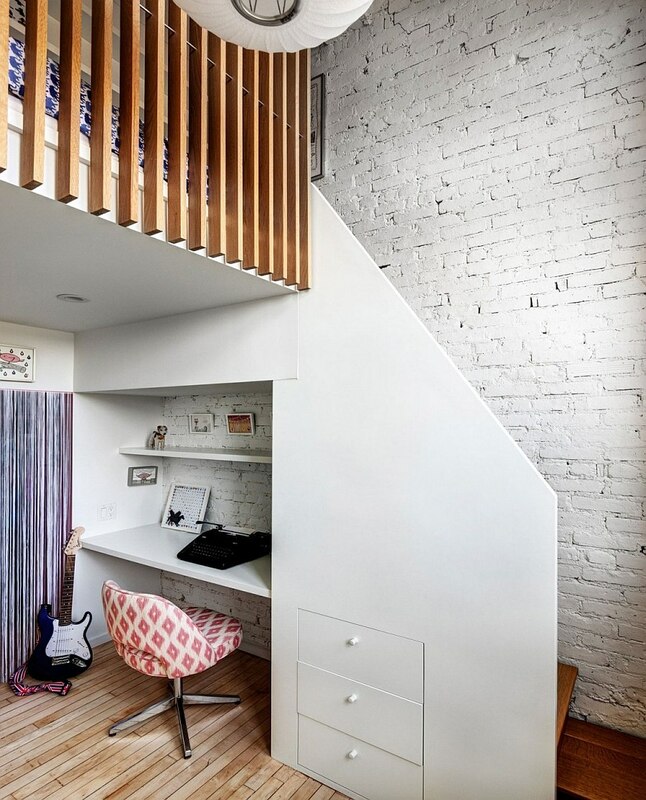 If there’s enough space it’s possible “to hang out” into it with stairs as much as you wish. It’s not a secret that a bedroom usually has its place in mezzanine, as horizontal bedroom function is very comfortable for that. 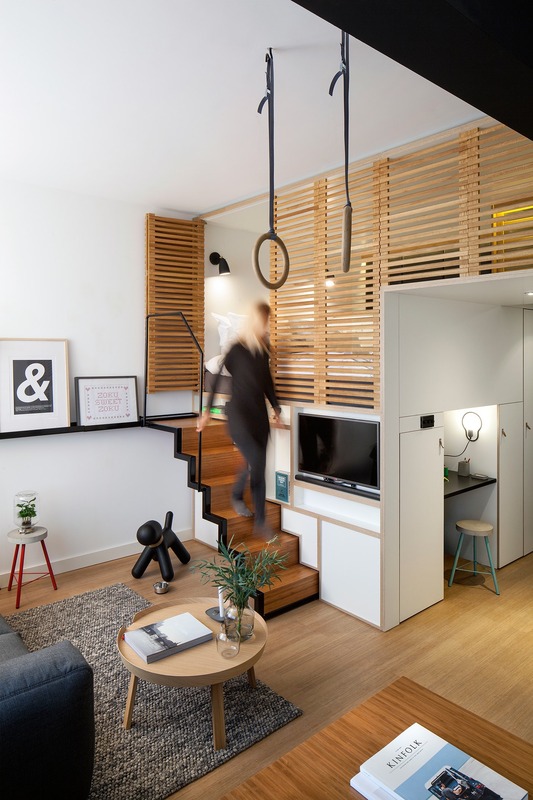 A mezzanine is not a novelty in a children’s room, rather small flats or even visa versa – in the huge-area-apartments and if there’s enough space it’s possible “to hang out” into it with stairs as much as you wish. 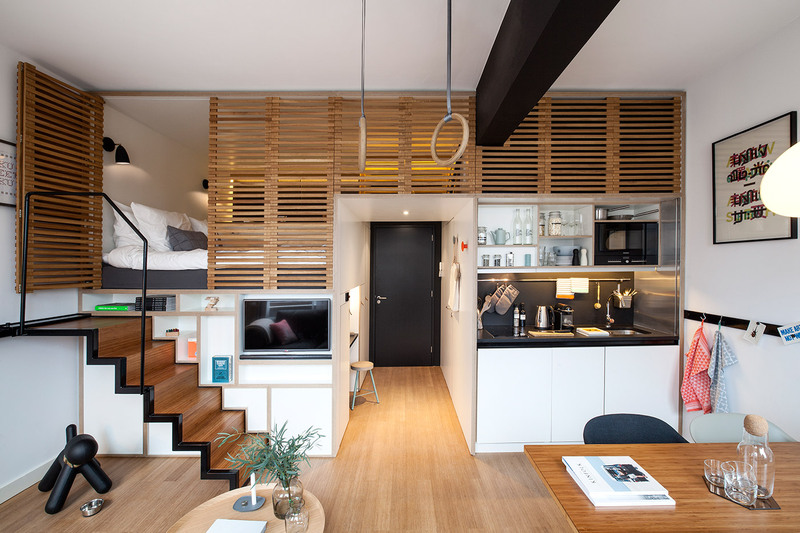 Another business is when there’s very little space and when only ladder doesn’t fit and one wishes more original and esthetic design solution or to partly hide them. Such solutions definitely exist and I’m glad to have the opportunity to represent them. The first example for those who follow my blog should already be seen. 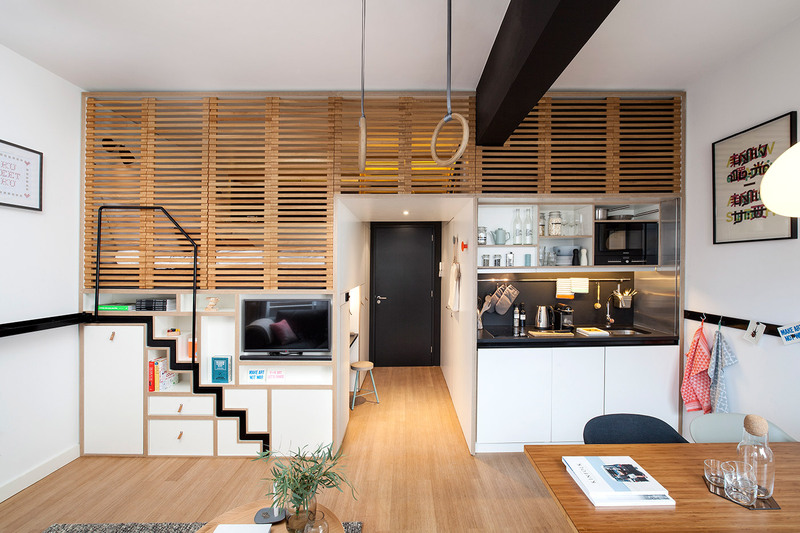 I’ve already written earlier about this 29 sq.m flat. 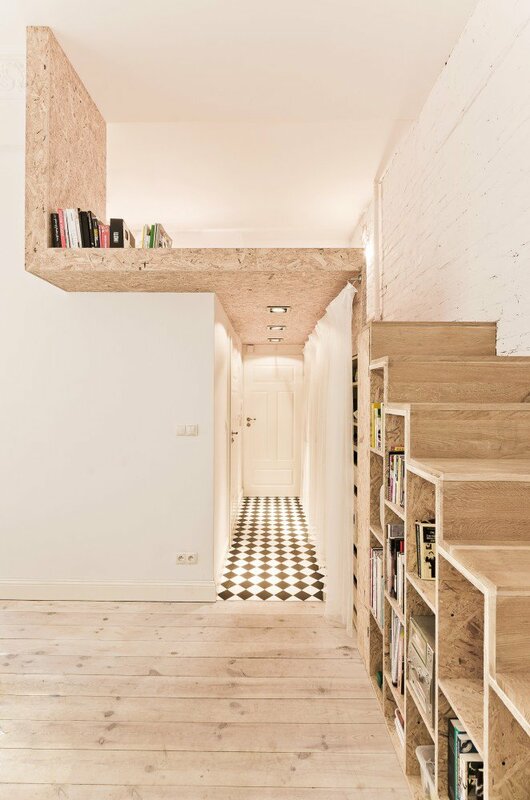 Probably it’s not news for everybody that a space under stairs can be used purposefully and that’s probably the best solution, as a mezzanine is most probably made not due to the overload of space but its shortage, therefore, additional space under the stairs wouldn’t be harmful for anyone. 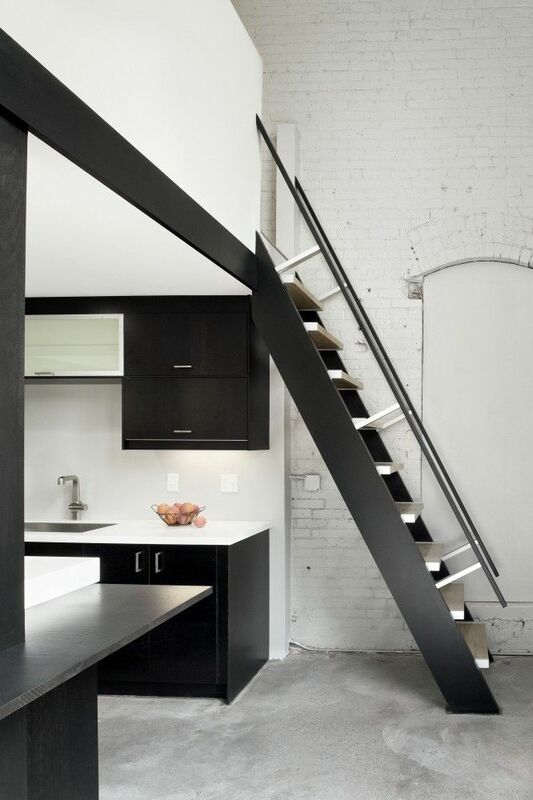 Metal ladder can look rather charming – surely not everywhere, but mostly in industrial style loft type interiors. We see in this kitchen that an additional worktop is organically incorporated from a worktop to stairs. 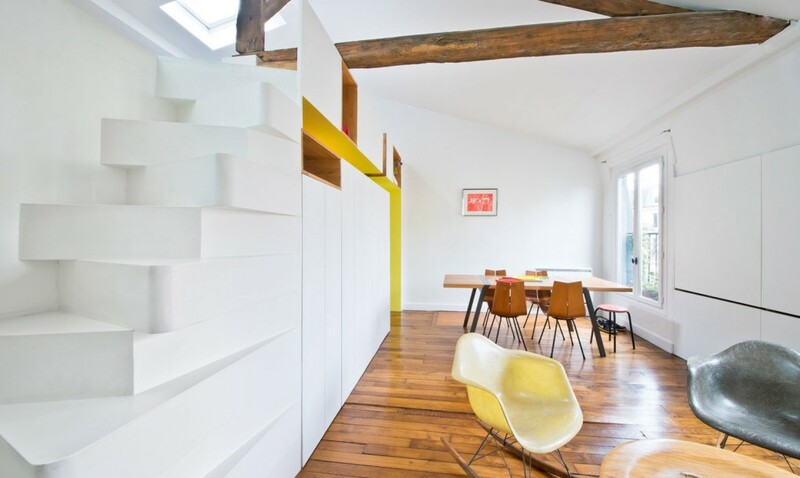 Stairs are hidden esthetically in a children's room and a space under them is reasonably used establishing a work zone with several drawers there. Looking from the front it looks simply interestingly projected work place, however, they hide stairs into mezzanine. An excellent solution! 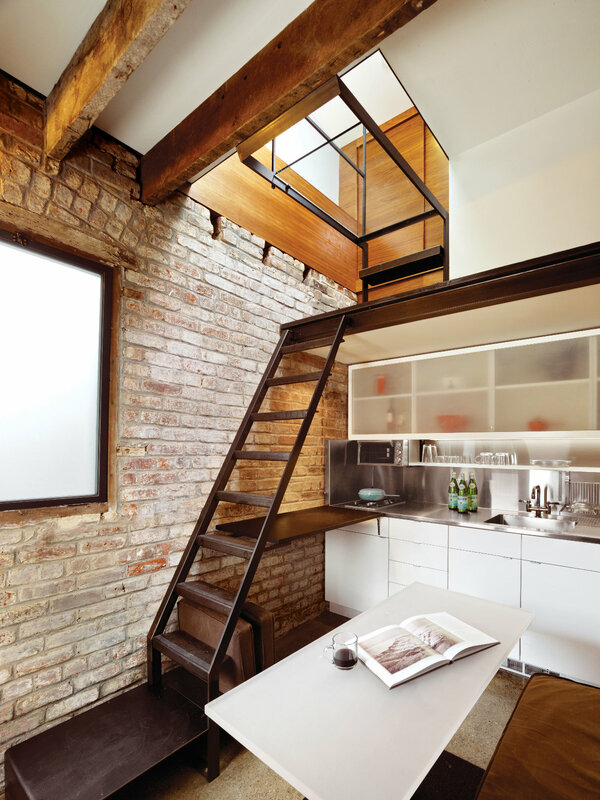 It’s one of the best solutions of mezzanine I’ve ever seen. 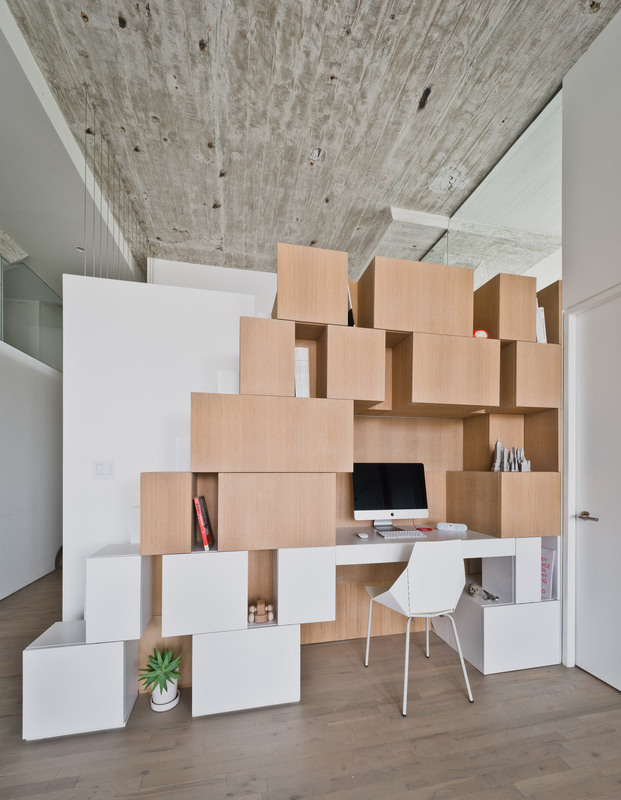 Just take a look how reasonably a bedroom is hidden and everything is joined by louvred doors. 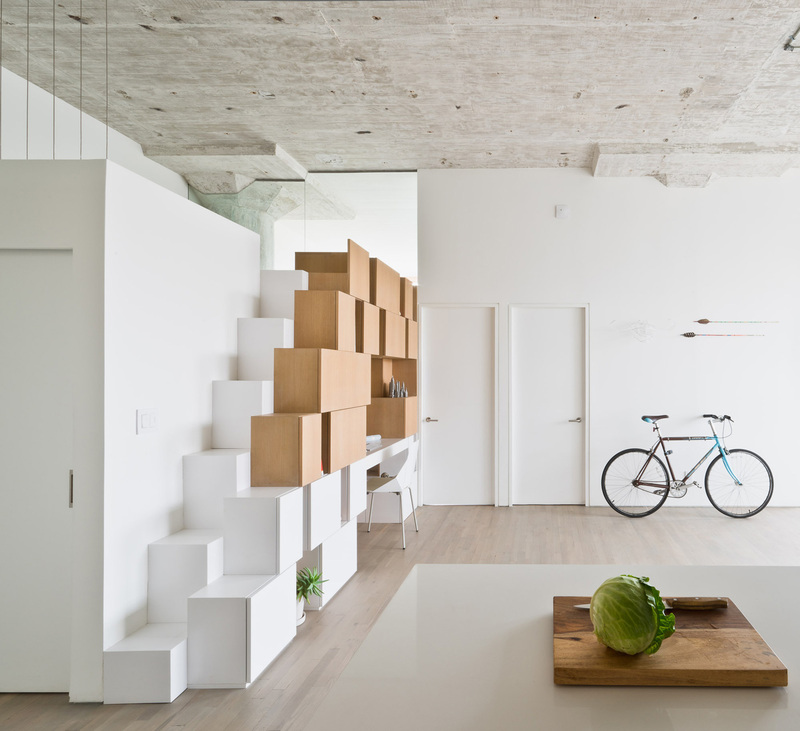 Moreover, stairs can be hidden in shelves that have been projected especially for that. One more perfect example. 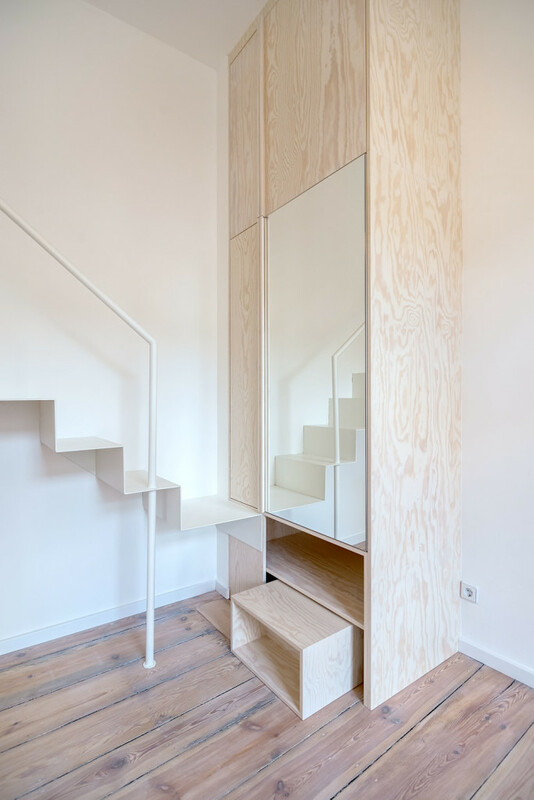 The stairs themselves – endlessly minimalistic and laconic, however, the part of levels is hidden in a wardrobe. Even though I don’t like the colour green this one is so “delicious”! 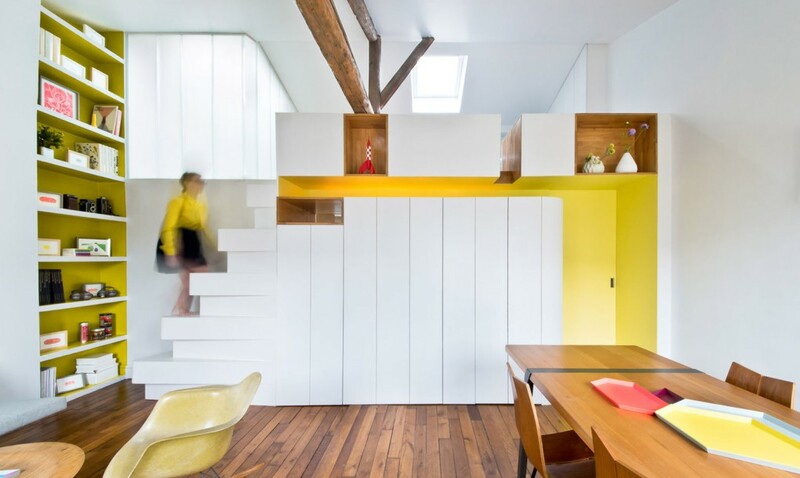 And mezzanine stairs in a kitchen perfectly joins with a common kitchen solution, as plays the role of hanging cabinets in the quickest way. 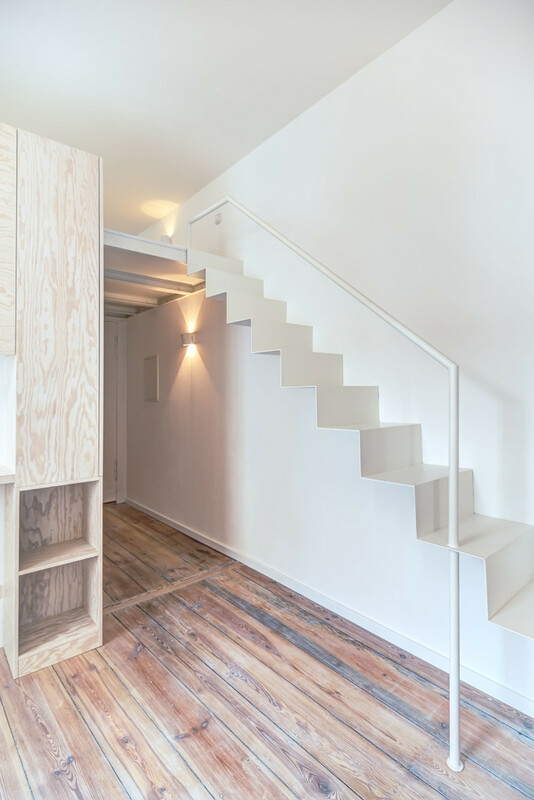 Non-standard stairs and non-standard space. Labai sudomino Jūsų genealios idėjos! Man reikalingas svetainėje baldas, kuris būtų kartu ir laiptai. 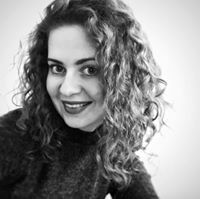 Ar galėtumėte pagelbėti su savo idėjomis projektuojant? Tel. 867010677 Lauksiu skambučio.